To finish off the signalling I thought of those small disc signals you see by the side of tracks and how good it would be if my railway had some. But is this another can of worms I'm about to open I ask myself? The starting point was the purchase of the signals themselves. I already had a couple of 'cosmetic' ones in the first section of my railway but wanted working ones for the sidings in the fourth section. I started looking at how I would install ground signals in this section thinking that they were just a different type of signal doing the same sort of thing that home and distant signals do. But it soon became apparent when reading up on them (and dare I say it), asking for help on forums, that they were anything but. Having taken onboard advice and digested published material describing their use into consideration, my thinking has moved on to the extent that I see ground signals as multipurpose and now not in the same sense as ‘normal’ signals. To be specific for my purposes, I wanted to use them purely in conjunction with shunting activities. Michael Vanns book on ‘Signalling in the age of steam’, on page 50, talks about ground signals as being part of the family of ‘subsidiary’ signals. This group of signals would often be alternatives to the standard type of semaphore signal placed on a pole. Their job; to work in places where using ‘running signals’ would not be appropriate. So no change of use there! By the 1880’s more use was being made of ‘subsidiary signals’ to control shunting movements as well. Like running signals though they could only give one of two indications at any one time but the ……. Terminology used to describe them differed according to the individual companies employing them. By this, I take it to mean that usage varied. For instance if used in a calling on situation it would only indicate to the driver that the line was clear to a certain point and no further or in the case of a platform being involved a train could enter it with caution even if it was occupied by another train ahead. But to use his words in particular about Ground Signals this was ‘’where most variety was evident’. Even to the extent of what they were called. ‘Dollies’, ‘dummies’ and even their design was not to any particular standard. So, I was still not clear as to how I would be using them. Turning to Adrian Vaughan’s book ‘A Pictorial Record of Great Western Signalling’, he describes how in a sense they started out as direction indicators like normal signals but used in restricted situations and as such had limitations as to use. To make sure that safety in use was maintained, they wouldn’t be connected directly to points because if they were, they could only give a proceed aspect according to the way points were set properly. But, to keep it within safety limits they would only be interlocked to points by means of a locking plunger that made sure that they could only be worked from a signal box by a separate lever and could only show route, if the points were set correctly. So, the ground signal here still seemed as functioning to show the road. Sifting through numerous pictures and plans of station and siding arrangements with the odd ground signal in them showed that there were two distinct situations where a ground signal could, (although not always), be used. When leaving a main line to enter a siding or re-entering the mainline from a siding. The ground signal would be interlocked with points but its movement is controlled separately from a ‘signal box’. This was not to be found in every case though and where you would expect a ground signal to be in use often there was none, and vice versa. This has given rise to the notion that ground signals are non prescriptive and do and don’t appear according to some formulae that is unknown! Finally, it is common for them to be used in conjunction with a human element namely in the form of the shunter. Engine movements where ground signals are to be found are slow. They are often under the control of the shunter with his pole and often in situations where points are operated by ground frames there would be no signal. A certain amount of waving to the signal box with a pole, flag or lamp would often suffice! These are used to control shunting movements within station limits including movements through crossover points and into and out of sidings. The purpose of this is to allow an engine to perform movements not normally allowed by running signals, because shunting movements are undertaken at low speeds the signals are normally placed on small posts on the ground as there is no need for them to be seen from a far. GWR shunting signals started life originally much like a small version of normal semaphore signals. Eventually these were replaced with a white disc with a red stripe painted centrally horizontally across it. The disk was rotated through 45° to show a clear aspect. In sidings where a head shunt was provided there would often be found a different type of ground signal. This one known as a “Yellow Disc” took the same form as the normal discs but had a yellow stripe painted on them instead of red. The purpose of this type of signal was to allow a train to pass at danger providing the route was set for the head shunt and not onto the main line. This enabled shunting to proceed in and out of sidings and into the head shunt without the signalman having to clear the shunting signal each time. Bearing all this in mind, and suffering from information overload, this is what I have decided to do. On the fourth section of my railway where the branch line is and several sidings are used for storage and access to the malt house I will put my working ground signals. They will be operated by levers akin to the nearest signal box setup, (I don’t at this time have interlocking installed on the railway so it will be assumed that is taken care of or in my book 'fudged'- So how will this be 'fudged'? The points are CDU controlled and snap to attention when asked, the signals on the other hand can be slowed down so that it appears that they only change after the points have been set properly - da da!). Not all sidings on my railway have ground signals as they would in reality. I will use this one area to install working ground signals and the project will investigate how best to achieve this. 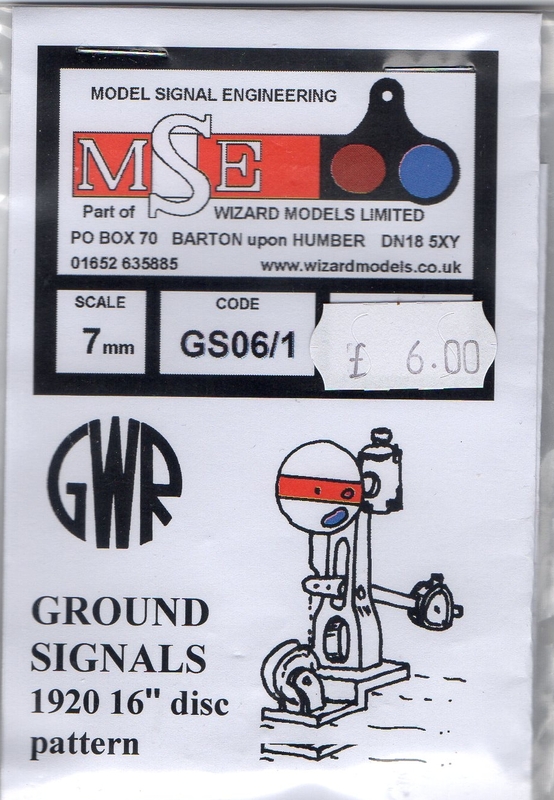 The MSE ground signals have been glued to a brass pipe base as shown above. The 'pipe' consists of three pipes the smallest will take the wire from the signal to the servo. I've left the length far in excess as to what will be needed for now, but they will be trimmed to the thickness of the baseboards. Click the image to enlarge it. Here are a couple just slotted into their holes but far from finished! And to finish off the details, i have added relay and electrical boxes near each signal box and signal. I have decided to add another signal box to control the ground signals. A suitable place is shown below. The amount of rotational movement with ground signal discs is minimal and this has proved to be difficult to maintain. Even with the brass piping the amount a servo has to rotate is very small. With hindsight I would have made a brass sleeve for the disc to rotate in as well. The smoothest of movement is key to the success of a signal working properly. Another development with these ground signals is the change in activating the points as mentioned before. I am converting the switch bank so that the Cobalt-S switches work the points as well. this will do away with the PECO switches I have used previously. All the switches below will be redundant. To be replaced by these now working both points and signals. A final double ground signal is to be installed at the far end of Longhampton Bridge platform, to control running round activities. This will require a double servo control board, two servos and brackets and two more lever switches all housed in a small control box. The final touches are shown above with a cobalt-s switch controlling both signal and point.